That first day was rough. There were a lot of tears. Of course the were all from me when I got to the car, not from my little girl as I dropped her off for kindergarten. I wanted to do something special for her first day, so we stopped for ice cream on the way home, and a tradition was born. It’s back to school time for many. Whether you have a child just starting school or you’re looking for a new idea to make this year extra special for the kids, these 15 back to school traditions are sure to make the time memorable. Whether your child attends public or private school or you homeschool, these back to school traditions will make that first week back fun for everyone. Serve a Special Breakfast. Cut their toast in the shape of a heart. Make a smiley face on top of their cereal with some sliced up fruit. Or try one of these 21 Back To School Breakfast Ideas. Grab one of these Free Printable First Day of School Signs from Simple Play Ideas to make the picture even more special. Have a scavenger hunt. Put those school supplies to work before the big day with this printable School Supply Scavenger Hunt from The Dating Divas. There’s a picture version for non-readers and a list version for older students. Craft together. Crafting is always popular when it comes to holidays. 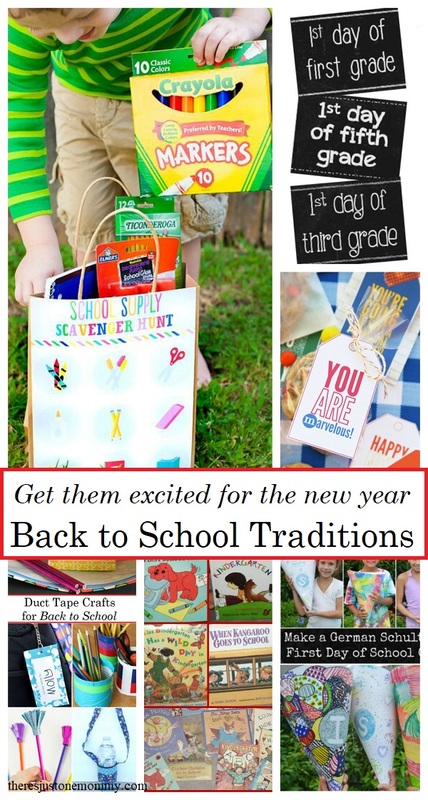 Celebrate the start of the school year with a few Duct Tape Crafts for School from There’s Just One Mommy. Try a bit of magic. Ease their anxiety with this Magic Dust for the First Day of School from The Educators’ Spin on It. Pray. This Back to School Prayer for Kids from I Can Teach My Child is perfect for kids heading to public school, private school, or homeschooling. Read a book. These First Day of School Books from There’s Just One Mommy are perfect for those starting preschool or kindergarten. Set up an interview. This First Day of School Interview from Spaceships and Laser Beams is the perfect way to record your child’s interests and save them. Look them over together at the end of the year or save them for when they graduate. Give them a gift. Try the German tradition of making a giving your child a schultute, or school cone, and fill it with small treats and gifts like scented markers and stickers. Check out this post to learn How to Make a Schultute (Kindercone) from Red Ted Art. Give the German tradition a twist and Make a Schultute as a First Day of School Teacher Gift like they did on Kid World Citizen. Send them a note. Write them a short letter and stick it in their lunch. For non-readers try drawing a silly picture to make them smile. Check out these Free Printable Lunchbox Notes from Our Best Bites for more ideas. Go Out for Ice Cream. When the kids come home from their first day, head to your favorite ice cream shop for sundaes and to hear about their day.